Our specialist flat cleaning service encompasses all rooms in the flat, including the kitchen, bathrooms, hallways and entrances, and all bedrooms. We’ll vacuum, mop, clean internal windows (frames and glass), and wipe down the walls. We’re very thorough so we’ll wet clean all surfaces, skirting boards, radiators, doors, and door frames. Any built-in cupboards are cleaned inside and out. We also make sure we get all the electrical fixtures like switches, ceiling lights, wall lights, and sockets. We’ll catch any cobwebs that are lurking around, too. Specific cleaning that applies to rooms like the kitchen and bathroom include de-scaling and de-greasing, cleaning the outside of white goods and appliances, and cleaning hobs and extractor fans. Contact us for a free quote on making your flat shine. For understandable reasons, a clean bathroom tends to be important to most people. But they can often be overlooked when a tenant cleans a property or a cleaning service is providing a general clean. But not us. We start a bathroom clean with a general mop and wipe down. Then we provide a thorough clean that includes de-scaling all fixtures, baths and showers, basins (top and bottom), toilets, tiles, and shower trays. We’ll also de-scale floors in wet rooms. Smears aren’t pretty or professional, so we always polish shower screens, tiles, baths, basins, and taps. For a free quote, get in touch. A general clean encompasses all rooms in a domestic or commercial property. That means the kitchens, bathrooms, bedrooms (or offices), and hallways and entrances. We’ll vacuum or mop every room, clean all window frames and glass, and wipe down all walls. We’ll also wet clean any surfaces, skirting boards, radiators, doors, and door frames. Any electrical fixtures like lights, switches, and sockets will be cleaned, too. We’ll also give any furniture or appliances in the property a wipe down. If you need a deeper clean for specific rooms or appliances, take a look at our other cleaning services. The period between one tenant moving out and another moving in can be an excellent time to thoroughly clean a property. Our end of tenancy cleaning service is designed to clean areas of a house that might get overlooked by everyday cleaning. We’ll clean all hallways, entrances, living areas, and bedrooms by mopping or vacuuming, polishing windows and mirrors, wiping down any fixtures, framework, surfaces, and doors. If there are any cupboards or wardrobes, we’ll give those a good clean as well. For bathrooms and kitchens, we give all appliances and white goods a deep clean – including ovens, fridges, toilets, basins, and showers and baths. Any surfaces are de-limed and de-scaled, scrubbed and sanitised, and polished. Generally, we clean everything we can see straight away. Then we look for everything that isn't obvious and clean that. What we end up with are properties sparkling clean from top to bottom, ready for new tenants to move in to. Contact us for a quote on end of tenancy cleaning. The inside of a fridge often gets forgotten during cleaning. This can be a problem because bacteria from old food can survive for a long time in cold conditions. As well as leaving a nasty smell, they can potentially cause health hazards. 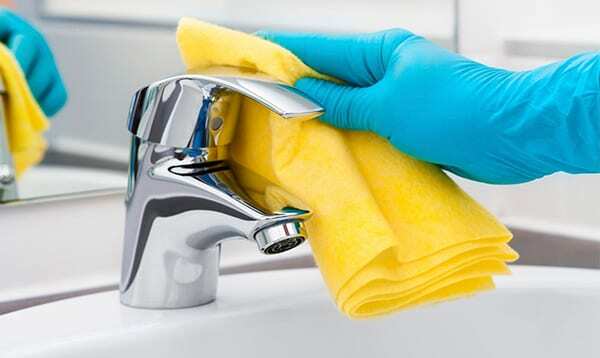 To make sure all germs and bacteria are eliminated, we use steam cleaning. The intense heat gets rid of all potential health hazards from germs. Once we’ve steamed the fridge we clean the inside with food-safe cleaning products. This leaves it looking like new, smelling fresh, and completely safe for food storage. Contact us for a quote on de-germing your fridge. Cleaning up after building work can be a messy affair. Dust just seems to get everywhere. Our after build clean is a service we’ve developed over the years to completely rid a house of any mess, dirt, or scuffs that can accumulate during refurbishment or building work. We can also cater to your specific needs. Just let us know what you need cleaning during the after build period. Whether you’re a tenant, homeowner, landlord, or housing association – our domestic cleaning services can help you keep your property in the cleanest condition possible. A general clean sees every room get vacuumed or mopped, window frames and glass cleaned, and all walls wiped down. We’ll also wet clean any surfaces, skirting boards, radiators, doors, and door frames. Any electrical fixtures like lights, switches, and sockets will be cleaned, too. Any furniture or appliances in the property receive a wipe down. Specific cleans for bathrooms, kitchens, and fridges encompass special cleaning methods like steaming and de-scaling and de-liming. And the more thorough cleaning services combine all of the above as well as specialist cleaning methods for removing dust. We offer one-off cleaning services for people who own their own home or regular cleaning services for people or organisations with a portfolio of properties. We’ve been working with house associations and private landlords for many years. So we’re used to cleaning multiple properties to high standards. Get in touch and we’ll give you a free quote. Having a clean kitchen is very important to most people – there’s got to be nothing worse than moving into a new place and finding a grubby kitchen. That’s why we take the time and care to de-scale sinks and taps, de-grease all surfaces and tiles (especially around cookers and microwaves), and give all tiles a good polish to make sure they’re smear-free. We also give the inside and outside of cupboards (including on top), shelves, and draws a good going over. Any appliances and white goods are cleaned on the outside from top to bottom. That means fridges, washing machines, dishwashers, ovens, kettles, toasters, and microwaves. This includes hobs and extractor fans. We have an add on package if you want us to clean the insides of these appliances. This is because of the extra care and attention required to make sure the places that food is stored and prepared are properly cleaned of bacteria and germs. Take a look at our fridge cleaning service for more information. Get in touch for a quote on getting your kitchen clean. Communal areas of homes and offices can be tricky to keep clean. Many people coming and going means dirt accumulates in a short period of time. A lot of the time these are the areas that guests and clients see first and spend the most time in. It goes without saying that keeping these areas clean is essential. All communal areas have their floors, windows, walls, doors, and skirting boards cleaned and polished too. We can also incorporate any special cleaning requirements for communal areas. Just get in touch and tell us what you need. It’s not just homes that need cleaning. Offices accumulate mess and dirt faster than houses because so many people are concentrated in one place. Our cleaning team have been keeping offices clean for years and they’ve developed a cleaning routine that helps them get every nook and cranny. They’ll clean the sinks, toilets, and urinals – as well as restocking all bathrooms. Along the way they’ll empty all the rubbish and recycling bins. Then they’ll clean the windows. Depending on your preferences, they can also clean work stations, office equipment, and computers. All floors will be mopped, swept, and polished using wax floor buffers. This can include carpets, where our team can use dry methods or steam to thoroughly clean all carpets and get rid of any stains. If you like to keep your office environment green and full of life, we can also water all your plants and prune them when necessary. We understand that your building or offices might have special requirements, so just let us know and we’ll incorporate those into our routine. Contact us for a quote on office cleaning.